When the Padres came to the 2016 trade deadline, they had already made a handful of trades. Before the deadline, the Padres and Miami Marlins agreed to a 7-player trade. The Padres sent starting pitchers Andrew Cashner and Colin Rea, along with flamethrower reliever Tayron Guerrero, to the Marlins for Jared Cosart, Carter Capps, and two prospects. We all know the drama that unfolded after the trade, when Colin Rea exited his first start in his new uniform with an apparent shoulder injury. Rea subsequently tore his UCL and was going to need Tommy John surgery. The Padres relinquished one of the two prized prospects they received in the trade, Luis Castillo, back to the Marlins to receive the injured Colin Rea back. It was a sudden move by the Padres, which clearly hinted at something fishy going on. The Padres elected to send Castillo back to avoid any controversy with the Marlins and Major League Baseball. The Marlins ended up trading Castillo a day later to the Reds for Dan Straily. Shortly after the 2016 season, Padres GM A.J. Preller was handed a 30-day suspension from all baseball-related activities, as a result of withholding medical information on Drew Pomeranz. Pomeranz was traded to the Boston Red Sox during the 2016 season. The ironic thing is that Pomeranz remained healthy for the most part, and had a stellar 2017 season, posting a 17-6 record with a 3.32 ERA and a 3.84 FIP over 32 starts and 172.2 innings. The prized prospect sent to the Padres in the Pomeranz trade was RHP Anderson Espinoza, a top-20 prospect in baseball at the time. Espinoza ended up being injured to start the 2017 season. He ended up needing Tommy John surgery, and is likely out until the 2019 season. Oh the irony. Another pitching prospect the Padres received in a separate trade with the Marlins during the 2016 season is Chris Paddack. 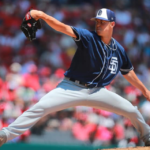 The Padres received Paddack for closer Fernando Rodney just before the All-Star break. Paddack ended up injured as well, needing Tommy John surgery, and missed the entire 2017 season. He recently made his first start since the surgery and picked up the dominance he had right where he left off. Paddack tossed six shutout innings, surrendering only three hits, no walks, and seven strikeouts. 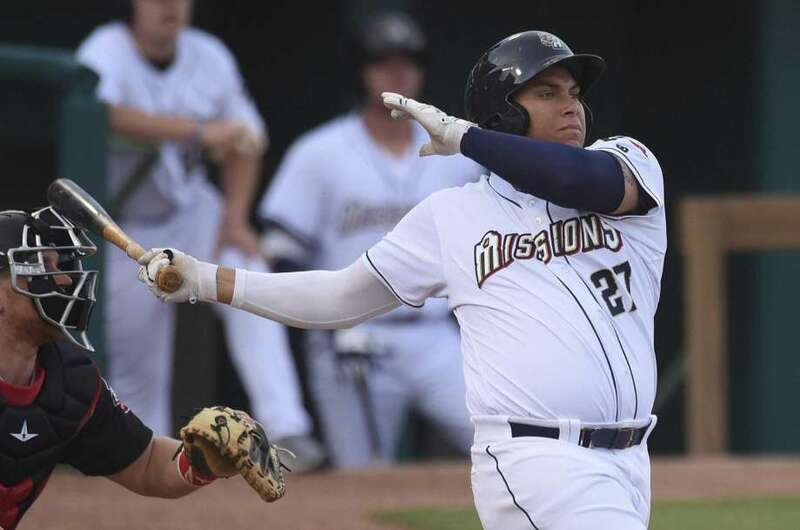 Anyway, the Padres still retained a high-value prospect named Josh Naylor. Naylor was hovering around the top 100 prospects in baseball at the time. 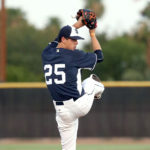 He eventually debuted on the Top 100 later that season and was ranked as the Padres’ 5th-best prospect. The outlook on Naylor’s value dropped a bit, as he is currently ranked 15th on the Padres’ top prospect list and not believed to be anywhere near the top 100 list. 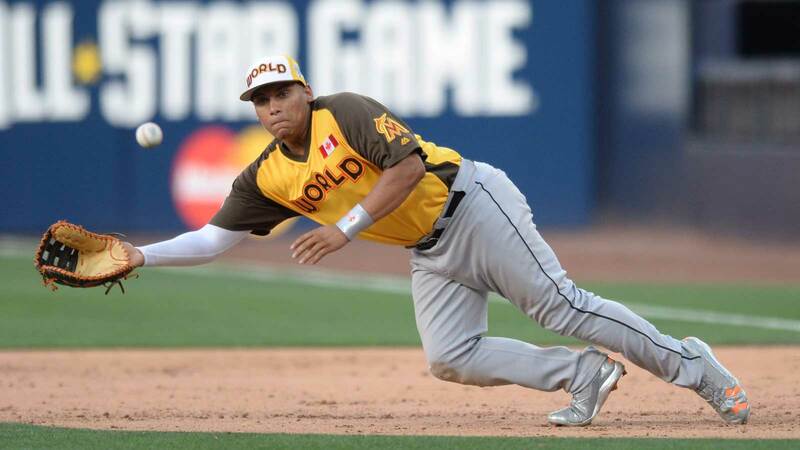 Josh Naylor was drafted by the Marlins in the first round of the 2015 draft. The left-handed first baseman is listed at 5’11, 250 pounds. He was born in Canada and played high school baseball at St. Joan of Arc in Ontario, Canada. He projected as a power hitting first baseman with great hit and power tools, but rated as very below average in running and fielding. Naylor has proved to be much faster than his 30-rated run and 40-rated field given by MLB pipeline at the time. Currently he has a 40-rated run tool and 45-rated field tool, which I believe is still too low. The man can get around the bases in a hurry and has proven to be an above average fielder at first base. He hustles and plays the game hard day in and day out. Josh Naylor also shows an immense passion to compete and to play the game. 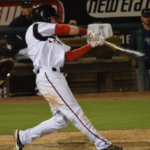 The Canadian slugger debuted in the Padres’ organization with the Lake Elsinore Storm in 2016. Earlier in the season as a member of the Marlins’ organization, Naylor was a part of the Futures Game held at Petco Park in San Diego. He played first base for the World team, going 2-for-3 at the plate with an RBI in the game. Across 33 games with the Storm in 2016, Naylor slashed .252/.264/.353 with three home runs and 21 RBI. He started the 2017 season with the Storm again, slashing .297/.361/.452 across 282 at-bats. He homered only eight times, which is considered low because he has long been valued as a power hitter, although Naylor played well and effectively enough to receive a promotion to Double A San Antonio. Naylor struggled a bit after his promotion, finishing the year slashing .250/.320/.346 and two home runs over 156 at-bats. He is only 20 years old, and is one of the youngest players in Double-A. Josh Naylor came into Major League camp with the Padres to start the 2018 spring training. Naylor held his own during spring training, hitting a home run and batting .211 over 19 at-bats. The Canadian infielder was reassigned back to Double A for the 2018 season and has slotted in as the Mission’s everyday first baseman. He got off to a scorching hot start with the missions in 2018. Through the first ten games of the 2018 season, Naylor slashed .472/.575/.1000 with six home runs and 14 RBI over 36 at-bats. He also had two games where he hit two home runs. Since then, Naylor has come back down to earth with the bat, but still has been potentially the best hitter in the Texas League. Currently, the first baseman is slashing .363/.448/.621 over 124 at-bats. Naylor has shown tremendous plate discipline, drawing more walks (18) than strikeouts (15). He has eight home runs with 29 RBI, and has more extra-base hits (16), than strikeouts (15). At the moment, Naylor has a hit in 12 of his last 13 games, with eight of those 13 games being a multi-hit performance. 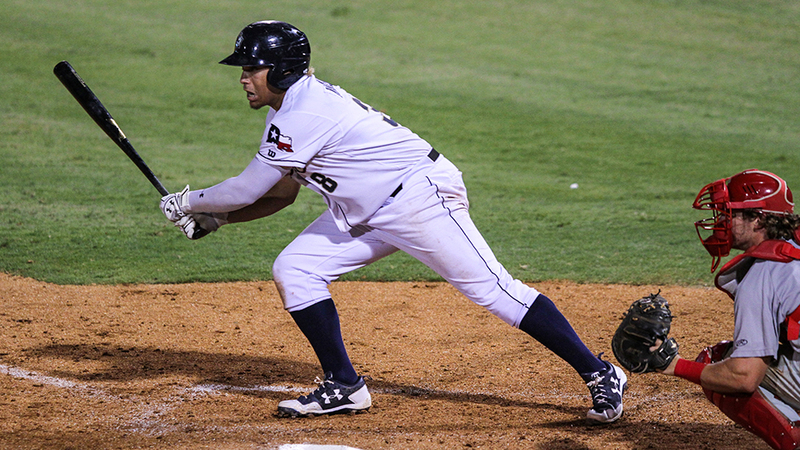 Naylor is an early favorite to be a Texas League All-Star and has been the lifeline of the Mission’s offense. He has solid splits, hitting a monster .382/.461/.663 off of right-handed pitching, while still hitting a solid .314/.419/.514 off of lefties. He has also shown great poise, hitting .345 while behind in the count. At 20 years old, a call-up to “The Show” seems unlikely, although he could be a candidate to be called up in September. It is much more likely, however, that Naylor remains in Double-A for 2018, and then spends 2019 in Triple- A. 2020 is a likely time frame for Naylor to make the Opening Day roster. The only issue is finding room for him to play consistently. If Naylor continues to produce the way he has, the Padres will find a place for him in the lineup. Many believed Naylor would better serve as a DH, but he definitely has the athleticism to be an everyday first baseman. Naylor has been receiving playing time in the outfield during the 2018 season. He has played seven games in left field. He likely will never be an above average fielder in the outfield, and has a lot of work to do to become an average defender in the outfield. Naylor has a small sample size in the outfield, but has logged 62 innings already in left field. He has committed two errors already over only 11 chances. It is a very small sample size, although that sample should grow across the 2018 season. The upside of giving Naylor time in the outfield and at first base, is that it expands his value and will create more opportunities for him in the future. I see the Padres doing this for that exact reason. Naylor is a first baseman, and the Padres signed Eric Hosmer to an 8-year, $144 million year contract this year, the largest in franchise history. 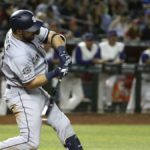 The contract has a player opt-out clause after the fifth year, so Hosmer will man first base for the foreseeable future for the Padres. 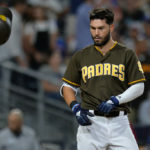 With Hosmer locked in as the franchise first baseman, and the outfield already far too crowded, Naylor could be a trade chip in the future for the Padres to address an area of need when they are actually in a place to contend. I personally hope the Padres hold on to Naylor, because I love his potential on the offensive side of the ball. He finds his success with his incredible bat speed. The slugging first baseman also has never been a big strikeout hitter, but this year has already taken massive steps, with only 15 over 100+ at-bats. He also seems to have taken a stride with his power, clubbing eight homers already in 2018, good enough to be tied for first in the Texas League with teammate Austin Allen. Naylor is also tied for the league lead in RBI, and is the leader in OPS at 1.069. 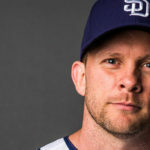 Naylor could find time in the field for the Padres in the coming seasons, backing up an aging Eric Hosmer at first, and as a pinch-hitter. He could also see time as a Major League outfielder if he can further develop at the position. There has been much worse options manning a Major League outfield in the past. Naylor has the athleticism to be an average defender in the outfield and has a good enough arm to make the throw from left. The Padres’ outfield is already far too crowded, but a young player doesn’t always pan out. 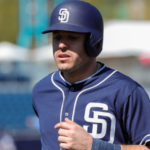 It is practically a guarantee that not all of the Padres’ young outfielders will ever live up to the potential they have and be a factor at the Major League level. Options are a good thing, and Naylor is making a case to earn a future spot on the San Diego Padres’ roster. He could become a very valuable bench player in a pinch-hitting role, or a valuable platoon outfielder, or even an everyday starter at first base or left field in the future. 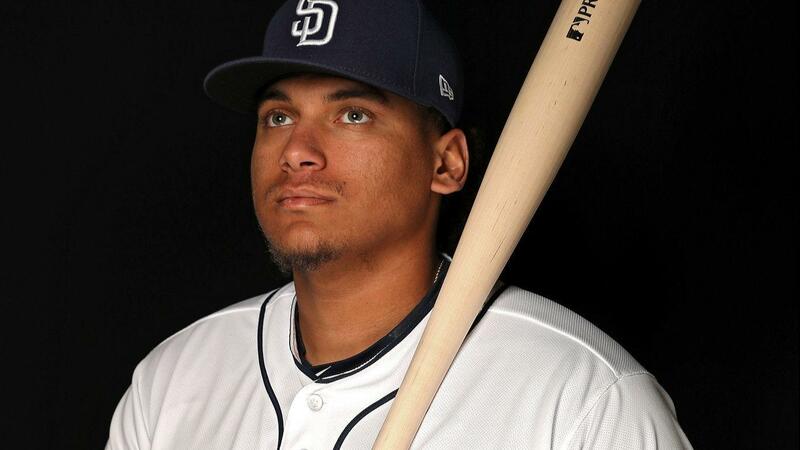 Regardless, Josh Naylor is one of the hottest players in the entire Padres’ organization in 2018, and it will be fun to watch his development over the rest of the season. Great article, Good to see Naylor arrive like he has in 2018.